The wildfire on the outskirts of Okanagan Falls is less than a square kilometre in size and roughly half a kilometre away from the area's regional library. Two new wildfires sparked to life in British Columbia's southern Interior near Penticton on Friday. 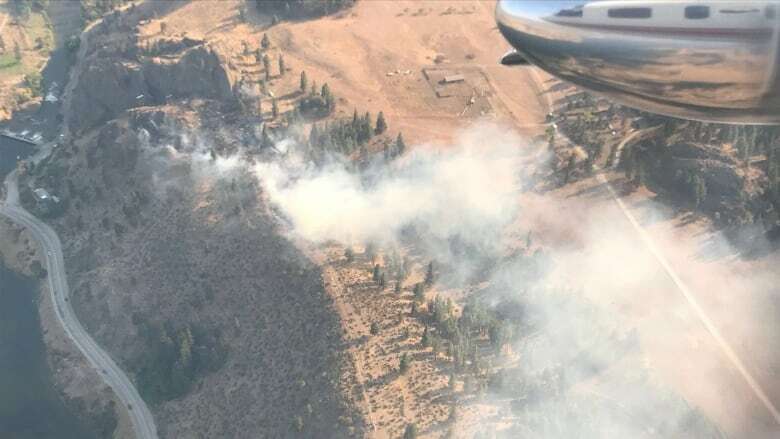 Nicole Bonnett with the BC Wildfire Service confirmed Saturday the larger of the two fires, burning south of Penticton on the edge of the community of Okanagan Falls, remained within the local fire department's jurisdiction. Fire crews from Okanagan Falls and the BC Wildfire Service battled the blaze through Friday evening, and a skeleton crew of local firefighters stayed on scene overnight, Okanagan Falls fire chief Rob Oliver said Saturday. Bonnett said the service's fire origin and cause team returned to the scene early Saturday to look into what ignited the wildfire. "The fire is believed to be a result of some sort of human activity, so they'll be completing an investigation out there," said Bonnett in an interview from Kamloops, B.C. Oliver said it appeared the fire started near the Skaha Lake outlet dam before burning through grass and sagebrush and up a bluff. "A bomber and a helicopter came out right away, our crew was on the initial attack, and we got it stopped and a guard around the whole thing," he said. "It's basically just mop-up and we'll be finished by dinner." The fire chief did not know the exact cause of the wildfire but said the RCMP were on scene to examine the suspected starting point. Bonnett said the service does not expect the fire to grow outside of its current perimeter and the few structures in the area were in no danger from the blaze. "The size is subject to change a little bit, but it won't be the result of fire growth, but more accurate mapping at that point," said Bonnett. A smaller wildfire burning near the western edge of Penticton was still being monitored for hotspots, but it was expected to be extinguished Saturday, said Bonnett. An air quality advisory is in effect for the city, though Bonnett said she believes this is likely due to the smoky air from wildfires across the province nestling into the area rather than the two newest blazes. Bonnett said even as the temperature cooled off slightly in the Kamloops Fire Centre this past week, a campsite fire ban remains in effect for the area, which was still classified as high-risk. Bonnett added the campfire ban also includes additional recreational activities for everyone to be aware of. "Fireworks, fire crackers, tiki torches - things like that."